4x12 Wicker Antique Brass Floor Register Discounts Apply ! One step metal floor register installation has never been easier than with these beautifully crafted wicker registers. We will meet your needs for heat vent covers that will allow you to control the airflow in your home or business. 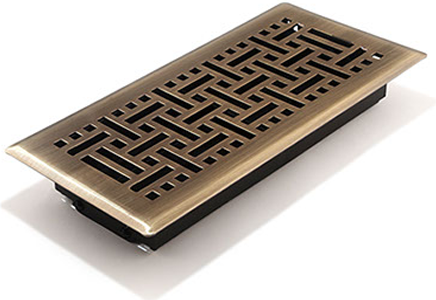 Our metal floor register can hold up to 200 pounds because it is made with a solid steel core. This wicker heat vent cover is finished in antique brass and will add luxury to any room. A protective coating the metal floor registers against corrosion and tarnishing. These heat vent covers can be used also for cooling needs. Our 4 x 12 antique brass metal floor registers are the product for you! ***Hint: Industry standards ask that you do not measure the existing metal floor register dimensions. Rather than this, you must measure the actual hole opening in the floor. This register will fit a 4x12 hole opening. Heat Vent Cover Faceplate Dimensions: 5 3/8 inches x 13 3/8 inches. 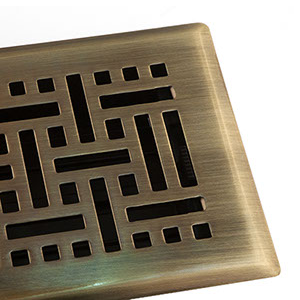 Our heat vent covers come in many of sizes and also an assortment of finishes. This antique brass metal floor register will brighten any room so order yours today!